I found this little gem at Real Mom Kitchen ages ago. My family loves pizza (who doesn’t?) and we seem to eat it in one form or another at least once a week. 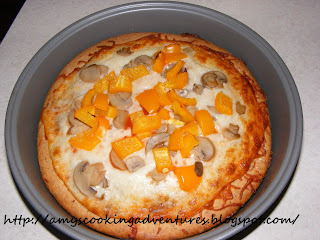 When I saw this recipe for Pizza Hut pizza, I was giddy with joy. Pan pizza without having to order it? Yes please! Of course, I couldn’t resist modifying the recipe to make a whole wheat crust, but I don’t think it takes away from the Pizza hut taste (feel free to use 4 cups all purpose flour if you want it to be more authentic). This makes three 9-inch pizzas. I use two 9-inch cake pans, and one 9-inch glass pie plate. The two different kinds of pans seem to bake up a little differently. The best way I’ve found to accommodate for these differences is to place the metal pans on the top rack (fairly high) and the glass plate on the lower rack. This ensures that the pizzas are evenly baked. 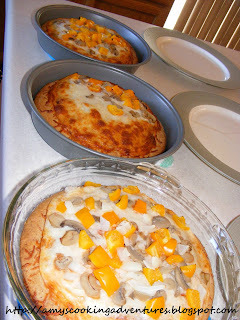 One of the best things about this recipe is that it makes 3 individual pizzas that you can customize. I can make a cheese and pepperoni pizza for my son, and put onions (ick) on my husband’s pizza. This pizza is quite filling and we usually have leftovers for the next day, of course I have been known to hog out and eat my whole pizza in one sitting…ugh! Combine water, yeast and sugar in a small bowl. Cover with a damp towel and let sit for 2-5 minutes, until foamy. Pour into a large bowl. Add salt, canola oil, dry milk, flax seed, whole wheat flour, and 1 cup all purpose flour. Turn out on to a lightly floured surface and knead for about 10 minutes, incorporating remaining flour until you have a smooth dough ball. Divide dough into 3 balls. Roll into 9-inch circles, place in oil coated cake pans. Cover with a damp towel. Let rise in a warm, draft free area for 1 ½ hours. Note: the ideal temperature for raise bread is between 80 and 85 degrees. If your house is too cool and your dough isn’t rising, begin preheat the oven when you start mixing the dough, then place your pans on top of the oven. The heat from the oven will help the dough rise. Preheat oven to 450 degrees. Spoon 1/3 of the sauce on each pizza and spread within 1 inch of the edge. Place pepperoni on top of the sauce. Cover with 1 cup of mozzarella. Add additional toppings (I used orange pepper, mushrooms, and onions). Bake for 15 minutes or until cheese is melted and crust is browned. Remove from pans, cut and enjoy! Just made this and didnt have the flax seed so used cornmeal mix instead and used all white flour instead of the whole wheat. My family which is HUGE Pizza Hut fans, said forget Pizza Hut. This is MUCH better. Best pizzas they ever had. Thanks so much! My family is HUGE Pizza Hut people. Did this last night and they said forget Pizza Hut this is MUCH better. 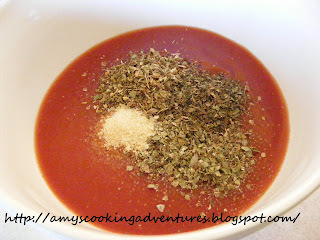 However I didnt have flax seed or whole wheat flour so I used 1/4c cornmeal mix and 3 3/4 c. all purpose flour. But it was excellent.